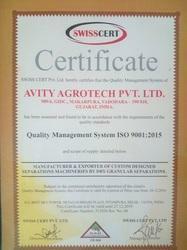 "Avity Agrotech Private Limited" (AAPL), was incorporated in the year 2005 as a proprietorship company and it was converted into a private limited in May, 2015. The company is engaged in manufacture, export and supply of complete Processing Machines such as turnkey plants for cleaning, grading, separation, hulling and classification of seeds, spices, oil seeds and grains. It also manufactures and supplies individual machines like Screen graders, drum graders, pressure de-stoners, vacuum de-stoners, gravity separators, air classifiers, spices crushers, garlic de-podders, maize de-germinators, seed scarifiers and various types of conveyors. It has a successful track record of giving services to more than 100 customers in India as well as abroad. Many of the customers are the top names in grain processing, spices, tea, coffee, snacks and pickle industry. We are located in one of the oldest and largest industrial areas in Vadodara-Gujarat, which gives us tremendous advantage in terms of supplier base and speed of delivery. Our plant covers an area of 10,000 sqft., with well organized and separated sections for offices, assembly, stores, machining, fabrication, grinding and painting. We have multiple seats of ‘Solid-Edge’, 3D design software from Siemens, which enables us to have better visualization and control over designing of large projects and also improves our response time. We have a strong supplier base of Laser cutting, CNC turret punching, CNC machining, grinding, powder coating, heat treatment etc., within the same industrial estate. Many of these suppliers are working with us since the very beginning. The company is promoted by "Mr. Anil V. Thakore", who holds a degree from Royal Agriculture college, U.K, and "Mr. Amit Pandya", who is a mechanical engineer with more than fourteen years of experience in machinery/capital goods industry in India as well as Europe. Mr. Anil Thakore has specialization in dairy science and tropical agriculture and has worked with N.D.D.B India, before starting his own business of agro processing machinery. He has received extensive training and know- how from ‘Forsberg-U.S.A’ and he has done pioneering work in popularizing their machines in India since 1990. Mr. Amit Pandya has specialization in tool engineering, production processes and sales of capital goods machinery. He has worked with American and European companies before joining as a full time director in this company. Quality assurance is one of the most important aspects of operations as each and every range of products is tested at all levels to maintain the industrial standards. From selection of raw materials to use of bearings, motors and accessories, only the standard components are procured and incorporated in the machinery. The finished products are tested on various parameters such as design flawlessness, performance and dimensional accuracy to ensure that the products meet international standards. We are located in one of the oldest and largest industrial areas in Vadodara-Gujarat, which gives us tremendous advantage in terms of supplier base and speed of delivery. Our plant covers an area of 12,000 sqft., with well organized and separated sections for offices, assembly, stores, machining, fabrication, grinding and painting. We have multiple seats of ‘Solid-Edge’, 3D design software from Siemens, which enables us to have better visualization and control over designing of large projects and also improves our response time. We have a strong supplier base of Laser cutting, CNC turret punching, CNC machining, grinding, powder coating, heat treatment etc., within the same industrial estate. Many of these suppliers are working with us since the very beginning. Being a client-oriented company, the company always strives to offer the best products at the best price, at the best time and with the best services. Leveraging on our vast industry experience and transparent business approach, we have gained the trust and confidence of our clients based all over the India and internationally. 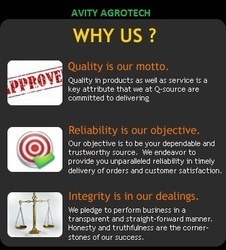 Avity Agrotech strives to exceed the expectations, excel beyond excellence and serve beyond satisfaction. Screen graders: (II, III and IV deck with capacities up to 50 tons/hr, with pre and post aspiration options). Pressure De-stoners: (capacities available up to 6 tons/hr). Vacuum De-stoners: (capacities available up to 15 tons/hr). Vacuum Gravity Separators: (capacities available up to 5.0 tons/hr). De-germinators- for maize: (capacities available up to 6.0 tons/hr). De-branners-for maize: (capacities available up to 6.0 tons/hr). Impact hullers-for sunflower seeds, mustard seeds, poppy seeds, cardamom e.t.c: (capacities available up to 1.0 ton/hr). Garlic De-podders: Capacities available up to 1.0 ton/hr. Turmeric crusher-for breaking dried turmeric to make coarse powder before fine grinding or for direct use: (capacities available upto 1 ton/hr). ‘Z’ type elevators with swing buckets. Turmeric cleaning and grading plants : up to 1 ton/hr. Multipurpose seed/grain cleaning and grading plant (Wheat, millet, sorghum, pulses, grams etc. ): up to 30 tons/hr. Mobile seeds/grain cleaning plant (up to 2 tons/hr). Niger seed cleaning and grading plant: up to 5 tons/hr. Coriander cleaning and grading plant: up to 5 tons/hr. Cleaning, grading and hulling plant for sunflower seeds, coffee, oats, neem, mustard and soyabean: up to 10 tons/hr. Cleaning and grading plant for whole seed spices (fenugreek, cumin, fennel etc. ): up to 4 tons/hr. Sesame seed cleaning and grading plant: up to 20 tons/hr. Sesame hulling plant (dry/organic process, no caustic lye or chemical required): up to 1 ton/hr. Maize cleaning grading +de-germination plant: up to 6 tons/hr. Garlic cleaning, grading, de-podding and sorting plant: up to 4 tons/hr. Chicory cleaning and grading plant. Our team strength is more than thirty five people. These are highly trained and experienced staff and a majority of them are associated with the company since the very inception. We have experienced 3D/2D designers, electrical engineers, mechanical engineers and production engineers in our staff and our production team is also qualified and experienced in all kinds of machining, fabrication and erection activities. We are known to have delivered single machines in as little as five days and full projects in fifteen days due to the strength, dedication and efficiency of our team. Our site erection and commissioning team is also highly experienced with fast and trouble free track record in India as well as abroad. For all dry granular separation requirements, from the simplest to the most complex, Avity Agrotech will provide the solutions in a clean and easy technology. With a firm adherence to ethical business practices and high quality products, the company has established a positive name and reputation in the industry in India and internationally. The company is promoted by Mr. Anil V. Thakore, who holds a degree from Royal Agriculture college, U.K, and Mr. Amit Pandya, who is a mechanical engineer with more than fourteen years of experience in machinery/capital goods industry in India as well as Europe. Mr. Anil Thakore has specialization in dairy science and tropical agriculture and has worked with N.D.D.B-India, before starting his own business of agro processing machinery. He has received extensive training and know- how from ‘Forsberg-U.S.A’ and he has done pioneering work in popularizing their machines in India since 1990. Mr. Amit Pandya has specialization in tool engineering, production processes and sales of capital goods machinery. He has worked with American and European companies before joining as a full time director in this company.